As the web grows and diversifies, so do the number of ways in which web pages can harm users (for example). To help counter this threat, Google, Norton, and McAfee maintain "blacklists" that warn users away from potentially unsafe webpages. But what exactly does it mean to get blacklisted by these services? Do the lists agree on which sites are harmful? When analyzing a blacklist, the primary fact to keep in mind is that the term "bad" is not well defined. As such, each list operates under different criteria. Google, for example, focuses on technical threats such as drive-by downloads. McAfee and Norton take a broader view, and will flag a site based on things like "annoyance factors" or "excessive popups." McAfee also signs up for any mailing lists it finds and records the amount of spam generated. Google limits itself to a binary response marking a site as potentially harmful (e.g., "This site may harm your computer") or not, while McAfee and Norton label websites as "Safe," "Caution," "Warning," or "Untested." Given these divergent criteria, the first thing that is immediately apparent is that it would be much too simplistic to call all blacklisted sites "malicious," while calling all non-blacklisted sites "safe." To see how similar or different these blacklists are in practice, we took a set of relatively popular domains on the Internet and queried all three lists. 57% were marked as potentially harmful or "Warning," with the other 43% marked as "Caution." Google flagged 5.2% with a "This site may harm your computer" label. Norton flagged 16.3% of the sites with a rating of "Warning," and another 14.4% with a rating of "Caution." McAfee flagged 38.6% of the sites with a rating of "Warning," and another 32% with a rating of "Caution." Per the statistics above, Google's list was by far the smallest, reflecting its focus on technical threats. 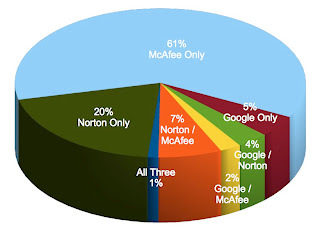 Norton had far more "untested" sites than McAfee, partially explaining Norton's lower numbers. Norton labeled less than half with "Warning," half with "Safe," and the remaining ones as "Untested." None were labled with "Caution." McAfee labeled a quarter with "Warning," a quarter were "Untested," and the remaining half were safe. None were labled with "Caution." McAfee's users lodged complaints about more than half of the sites. Norton and McAfee's blacklists also didn't agree with each other often. Of the sites flagged between them, only 4% were on both lists. Amazingly, the overlap between all three lists was less than 1%. were flagged only by McAfee. Only 1% were flagged by all three lists. These discrepancies shouldn't be surprising, given the fact that the lists employ different criteria and techniques for evaluating sites. But there are also deeper reasons for the lack of overlap: For one thing, the frequency and timing of testing can have a significant impact on the rating a site receives -- if a site is compromised after it's tested by a service, and that service doesn't test it again for another day, week, or even month, that site could end up infecting a significant number of its users while still being marked as "safe" by the service. For another, the diagnostics employed by these services aren't necessarily infallible -- web-based malware is sometimes masked to prevent its detection by some testing services. So what does all this mean for protecting your business? How should you deal with the fact that there are so many blacklists out there, testing your site on several different criteria and with varying levels of effectiveness? At Dasient, we believe the answer is being proactive about monitoring and protecting your site from web-based malware. To learn how we can help you do that, click http://wam.dasient.com. First charges these rolex replica pieces usually are and so excessive it's fully difficult with section of the popular male and it also will deliver an awareness of connected with lose faith. Although, this Omega imitation wristwatches fake omega include helped individuals to buy these devices in addition to simulate the high flyers with bespoked most of these wristwatches when in front of the crowd. Due to the fact replica hublot most of these pieces connected with Omega or maybe Rolex are high-priced, they will solely possibly be paid for because of the loaded along with the well known. Things that most of us view from the hands and wrists on the famous people can also be definitely not solely omega replica obtained by means of these individuals. Normally, there're forwarded to most of these wristwatches since they come to be model ambassadors these wristwatches. While buying the first designs can be performed, it will need a long time connected with fortitude in addition to working hard to help fake rolex collect like money to obtain just one Rolex. Although persons have this liberty to help flaunt this Rolex imitation wristwatches when in front of the good friends by means of obtaining these individuals on the net or maybe at a retail outlet watches replica uk that's this substantial bunch of this custom made pieces which enables it to help you provide those to good friends in addition to individuals to be a treat. The earth connected with custom made wrist watches possesses became available wonderfully with the wristwatch aficionados replica rolex gmt and in addition they can certainly buy this Rolex imitation or maybe Omega imitation wristwatches seeing that his or her. I am going to be honest. I used to believe in everything, when i was a lay-man, but after i completed my online degree in information technology, I have a decent knowledge how things work, therefore reducing my probability of going for an UN-trusted site. great your blog post thanks for you sharing. I really like Your website, I have added it to favorites. This post is awesome thanks for sharig this post. I hope you will sharing more an important informations. Los juegos se consideran buenos en numerosos medios. Ofrecen un mundo completamente nuevo, donde los jugadores no recuerdan cada estrés y cada problema y simplemente disfrutan de ese momento. Los juegos en línea friv están disponibles completamente gratis, y estos son bastante agradables. Estos videojuegos se consideran geniales para mejorar las habilidades de percepción. Si inviertes algo de tiempo jugando videojuegos en línea, definitivamente terminarás siendo un individuo cognitivo. Además, los juegos en línea ofrecen un sistema rico en funciones para jugar el juego con resultados de audio increíbles y es por eso que la variedad de reproductores de videojuegos en línea normales está mejorando bastante rápido. El mercado de juegos en línea ahora tiene la intención de ofrecerle más friv - toda la colección de juegos nuevos para asegurarse de que pueda invertir un tiempo de calidad en Internet. great information and nice blog thanks for share. Yes. Frederick's father had done well after the war, and Frederick was positioned to take over his father's engineering firm. And that's what geek t shirts they did. The church is the refuge that teacher t shirts you should be seeking from the storms of life, but that should also define and describe your marriage as well. If you can't come to your spouse with a problem, who can you come to? You have to give your custom tshirt printing spouse your support but you should be able to count on your spouse for the same type of support as well. You can't just have a one sided marriage.